Gold Krugerrands are gold coins native to South Africa that take their peculiar name from the combination of two words, namely, “Kruger” that is the name of famous South African President and “Rand” which stands for the unit of South African national currency. First minted in 1967 in the efforts to introduce South African gold to world investors, Krugerrand gold bullion coins remain one of the most popular means of investment in gold due to their exceptional purity and content. These coins are struck from 22 Karat gold and are considered the top selling bullion coins in the world. 1. The first and most important determining factor for Krugerrand value is the current price of gold. This factor will undoubtedly drive its value up or down. The market price of precious metals works in the opposite direction with market trends. When the economy is healthy, the prices of all precious metals are low and they soar in unhealthy market scenarios. 2. 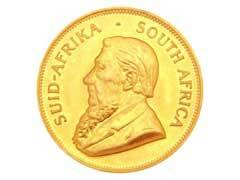 The size of Krugerrands is the second important factor in establishing their value. Krugerrand gold coins have no denominations but come in a variety of sizes. A full Krugerrand is considered a 1 oz gold Krugerrand coins, it contains a full troy ounce of gold. Half, quarter and tenth of a Krugerrand contain respective fractions of the gold content. 3. Overall Krugerrand value also depends on the gold dealers’ premiums. Smaller bullion coins are less popular among gold dealers and investors and tend to carry higher costs associated with premiums of handling smaller coin sizes. It’s considered to be financially wiser to purchase Krugerrand coins that come in full sizes due to lesser added cost. 4. Krugerrand value is also driven by a coin’s actual grade, or condition it’s in. An uncirculated coin is going to be worth more than the one that has been worn by circulation. Additionally, depending whether the coin is of bullion, proof or non-proof edition will drive Krugerrand value up or down. Generally, proof and non-proof editions are valued higher due to higher level of design elements like edge serrations and finer image details and clarity. 5. Numismatic value is another important factor affecting the actual Krugerrand value. Some collectors are willing to pay more money for a certain mintage year that they consider to be more valuable compared to the rest.